The need for a decision can be sparked by an event such as environment changes. The events can be internal or external. Whether it is proactive or reactive, it is imperative that managers immediately recognize this need and respond in a timely and appropriate manner. The managers must develop feasible alternative courses of action. If good alternatives are missed, the resulting decision is poor. It is hard to develop creative alternatives, so managers need to look for new ideas. Often a manager must consider these four criteria simultaneously. Some of the worst managerial decisions can be traced to poor assessment of the alternatives. Managers must now carry out the alternative. Often a decision is made and not implemented. Managers should consider what went right and wrong with the decision and learn for the future. Without feedback, managers do not learn from experience and will repeat the same mistake over. As you can see, all the steps describe activities. The first step, identifying when a decision is needed, is interesting and more a requirement than a real process step. The decision or the objectives are never defined. The generation of alternatives, the evaluation is described and the choosing process based on a ranking. The execution of the decision is another key point, as well as learning from feedback. From the number of steps, only three deal with making the decision, while the first one is identifying the need and the last two with the execution and learning from the decision. The process is more complete than other described processes, is good on the feedback loop and implementation, but has a very fuzzy frontend and limited decision definition steps. 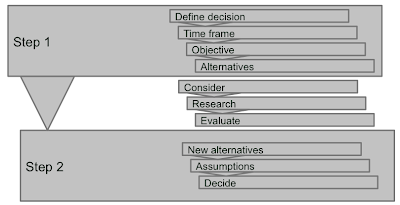 The process described here is directed at computer supported decision making. 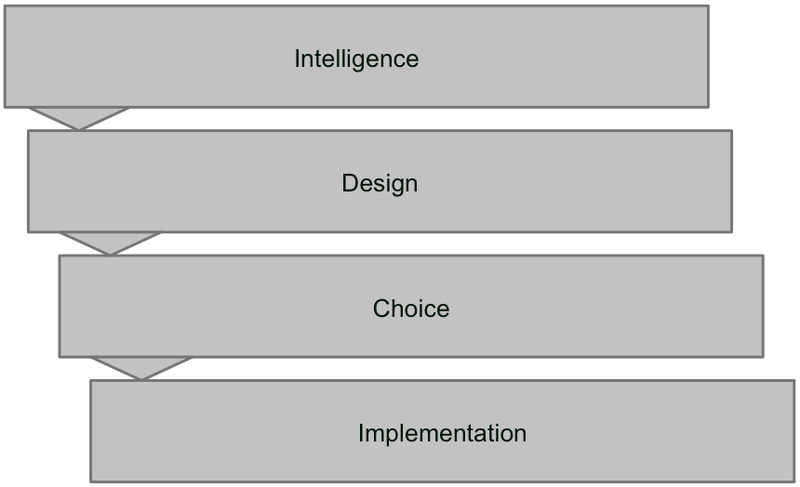 Intelligence is collecting information, design the process to generate a decision support system, choice the support for selecting the right solution and implementation the execution of the choice. The overall process is described in general steps. The four steps are not really labeled with actions. The description of the underlying activities is not very clear from the high level. The process is geared toward the use of computer aided decision tools. 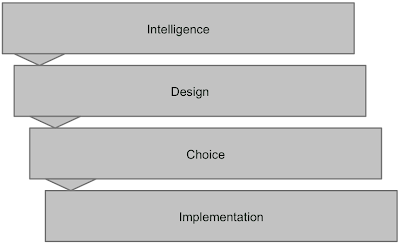 The design phase will be more important for the system supporting the decision making than for the alternative solutions.The border between design and choice is somewhat fuzzy, since it not really clear, where the solution design and where the model design end. The list of activities is much more telling than the steps, the step labels are more informative than in the 2 Step Process. In the series of different decision making processes, this process is called a 2 step process. Using the standard process description with this process is difficult. The main process steps are clearly labeled. 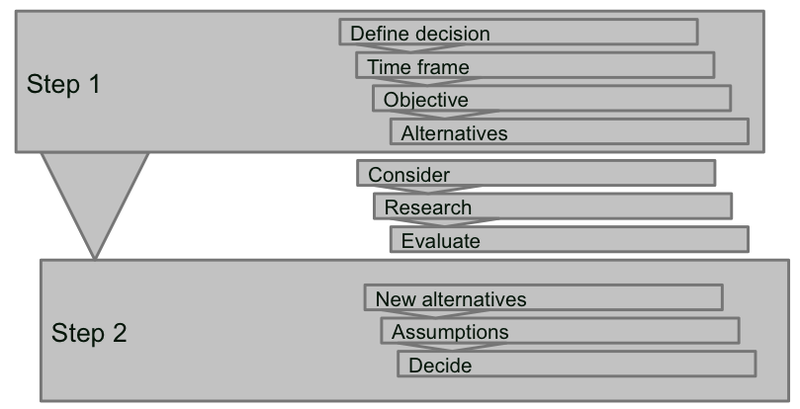 Step 1 contains the activities Define decision, Time Frame, Objective and Alternatives. As you can see, the step 1 is a preparation step. Define, what the decision is about is a very important step. The time frame helps you to manage the effort you are taking to get to the decision. The objective tells you what you want to achieve. Listing alternatives is a clear next step. After Step 1 and before Step 2 the three activities Consider, Research, Evaluate are listed. All three activities are important to move forward. Step 2 contains three activities: New alternatives, Assumptions, Decide. The point of new alternatives is a int, that during such a process, you may come up with an innovative new solution. The assumptions will help you make clear, what has been assumed during decision making. The last step is decide. In my opinion, this process contains a lot more activities and logical contents for a decision making than the classical approach. The key points for good decision making are included. It also takes into account, that you should not make all decisions right away. The gap between the steps highlights, that sleeping over a big decision is a good practice. The label two step is in my opinion a misnomer. The process is a three step process, the labels for the processes are too broad and too much of a label than a description. The activities are not clearly identified as activities(No verb noun description for an activity). For example, you are not clear, whether you should set the time frame, review it or decide about it. The only part with only activities is the none step in the process description between the two steps which are only verb based names. If you want to be in line with the other process descriptions, this is rather a ten step/activity process. I tend to differ on the sequence of activities. I want to include all activities in the evaluation, not exclude the new alternatives from it. I want to document the assumptions at the beginning. The Decide activity is an interesting point: The whole process is a decision process, so in this point the process becomes recursive. 1. You collect all possible choices for your definition. Identify what are possible solutions and review what will happen, if you choose one of these consequences. At the end of the first step, you should have a list of all viable options. 2. Now rank the options. Use your personal preferences to guide you through these options. At the end of this step, you have a ranked list of options, with the best option on the top of the list. 3. Now select the best alternative, which should be the one on the top of the list. This should lead you to the future that you wanted to have. This process is a short summary of the overall process and contains a high level summary of your decision steps. The process is clearly directed at one person deciding and the description is very vague in many parts. In my opinion, this process is to high a level to be helpful. Some of the key problems of decision making are not clearly addressed. Especially the ranking step is an easy description, but really hard to do. When you are done with the ranking, the third step is automatically done. While the process is simple and right, it is not very helpful for many more complicated decisions. It is so generic, that you may always find it to be applicable, if you are able to rank the options. You have multiple options to make decisions according to a series of authors, books and experts. I have compiled many different approaches - from a simple two step to elaborate multi-step processes. The different process versions will be shown in a standard process description, a short explanation of the steps and then be discussed in detail. See the comparison of the optional decision-making methods for further study. It all boils down that you have no idea how to get the decision made. If you have several options, just roll the dice - or if you have only two options, throw a coin. Number all your options. If you have less than six, this works best. If you have more than six, take two dice, but roll them in sequence and have 1-1, 1-2 til 1-6, 2-1, 2-2, ... until 6-6 as options, since 1 to 12 numbers are not evenly distributed. When there are numbers shown without a corresponding option, just roll the dice again, if the dice show a number that you have not included in your option list. If you can accept the solution that you have taken - really by chance - than you are done. Decision made. Move on. If you cannot accept this solution, do not directly roll the dice again. Review carefully, why you do not like the option. Forced with taking an unwanted option you tend to find some reasons that you had not considered beforehand. If this is an important point, add it to your evaluation list and reevaluate the other options as well. Sometimes, many other options disappear and you have one choice left, that fulfills all your evaluation criteria. If you really cannot live with the solution picked by the dice and there are several other options, take out the option from your decision base and rerun the process again. We are used to random picking of choices from early on, it is a simple acceptable solution for everyone. It is fast, if it works, it forces you to rethink the options, if you do not want to accept the result. Sometimes, you can avoid the hassle with finding the dice and make the decision by taking one option tentatively and run through the consequences what would happen, if you take this decision. Mentally take the decision and kick the tires. Test in your head, if the options would work, review the results and ensure that it is the right decision. If you are in doubt, carefully review, why you are in doubt and use this to create further evaluation criteria. This may work well in hiring, staffing or promotion situations. Imagine, which of the candidates would work well in the future environment. Sometimes, you can see clearly, how the different personalities and capabilities will work out. In other times, you do not have any idea. Than it may be worthwhile to create a project or task assignment that will help you to see a clearer picture. The last possibility is to break won the decision into smaller parts that are easier to make. Sometimes you can break down the ten choices in three to four groups of similar options and it is easier to make the decision about the group and then decide in the smaller selection of the group. This works especially well, if you are overwhelmed with the sheer number of options. If you want to buy a car and you look at the 20 different car makes, you may be able to break the decision down into a grouping - American car, European car or Asian car - and decide first on the general idea and then select between the different models. Or you could decide based on an important criteria for the use of the car, something like the gas mileage. If you are not changing your approach, you will not solve your problems. Use one of the three solutions mentioned above and you will find a good possibility to move on. One of the key issues is missing decisiveness. Making decisions is hard, because we are not well trained to decide. Although we know many decision-making tools, they are seldomly used. Why? Because we all do not concentrate on decision making and getting better at it. Like a top athlete, we need to train and prepare our decision making skills. Plus we need to review our decision-making performance. How many of you keep a list of todos? Do you keep a list of all the decisions required by you and by when? If you create an inventory of the necessary decisions, you are all of a sudden astonished: You are making many more decisions than you are aware. But you are definitely aware of the decisions that you are delaying or which feel difficult or those where you do not like the outcome. Clear Decisions is a blog by management consultant Torsten Becker. Torsten has experience in numerous projects in software development, product development, supply chain and in line management positions. Based on over 20 years of work experience, Torsten uses this blog to help the readers to make better decisions. 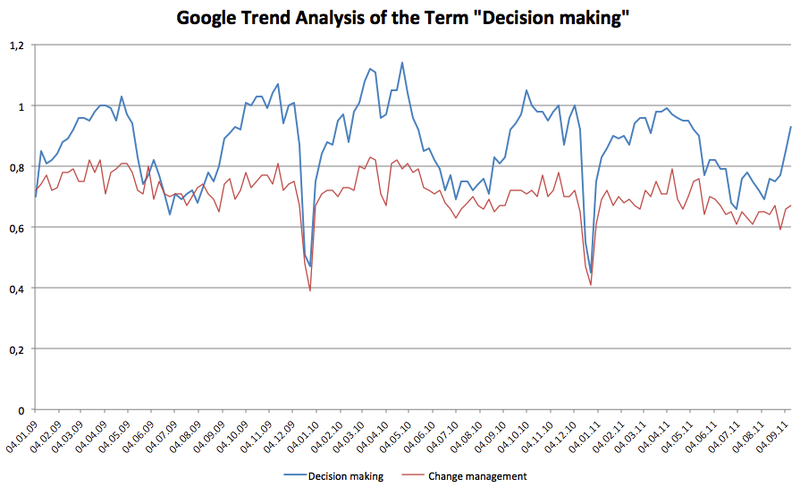 When looking at the Google Trends for the term decision making, there are some interesting trends to identify. 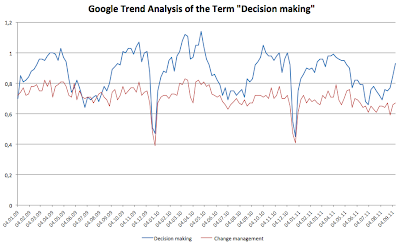 The following chart was created comparing the terms decision making and change management. The diagrams depicts the relative search volume for the two terms on a weekly basis. Wikipedia defines a decision as "... the selection between possible actions ...". A decision helps to set a course of actions. In order to be able to decide, you must be in a situation where the two ore more alternative actions and you need to choose one over the other. Decision making is the process of selecting.